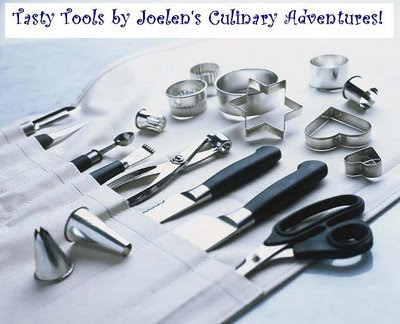 October Tasty Tools: Dutch Oven Round Up! It's definitely chili season and Karen shares with us a great variation to the classic red chili. Until some chilis that simmer for quite some time, this chili can be whipped up in minutes! 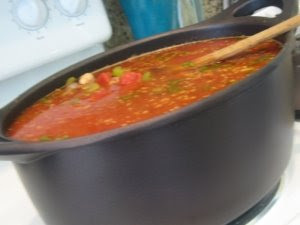 Check out Karen's blog of this savory and speedy chili recipe! 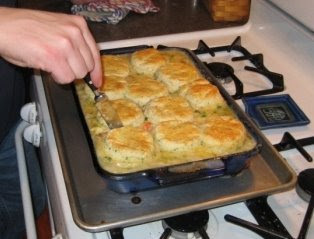 If Herbed Chicken & Dumplings doesn't sound like a comforting fall dish, I don't know what is! 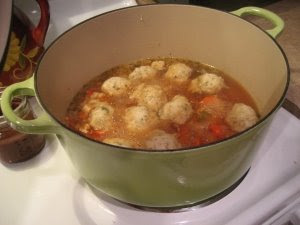 Renea joins us this month to share her Herbed Chicken & Dumplings recipe, a great dish to enjoy on fall days and to nurse yourself back to health. Check out Renea's blog for the recipe and try it today! To add some ethnic flair among our dutch oven recipes, Nancy shares her recipe for Japanese Curry. It's a great way to try curry that's different from Indian and Thai cuisines. Check out Nancy's blog for the recipe! One great thing about the fall season is the amount of one pot meals you can make. Laura shares with us a great Comfort Chicken dish that includes all the components of a well rounded dinner. To get the recipe and start making this for yourself, check out Laura's blog! What's fall without a classic soup like Pasta Fagioli? Amy joins the event with this soup, which is chock full of beans, pasta and sausage. Mmmm... I'm craving a bowl already! Check out Amy's blog for the recipe! Erin of It's All Happening! 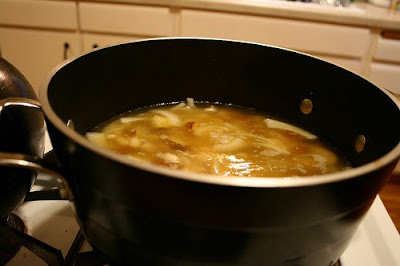 Erin brings to the table a Rustic Cabbage Soup which is a great change to the usual vegetable soup. I really love how Erin creates this from scratch and from the looks of it, does a delicious job! She's inspired me to cook with cabbage since it's been awhile that I've cooked with it. Check out Erin's blog for the recipe and make this soon! Chili is one of those foods that I think is best during the fall season. 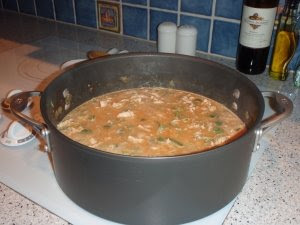 Emily shares with us a recipe for White Bean Chicken Chili that is easy to make and flavorful too! I especially like the use of green chiles in the recipe (we're big fans of it) and the creamy texture it has. Check out Emily's blog for the recipe! If it's made with rice, it's a dish that's sure to be a hit in our house. 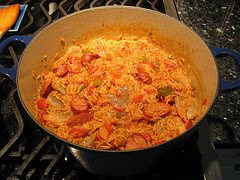 Therese's entry for Jambalaya with Shrimp & Sausage looks hearty and comforting, chock full of many pantry staples too. 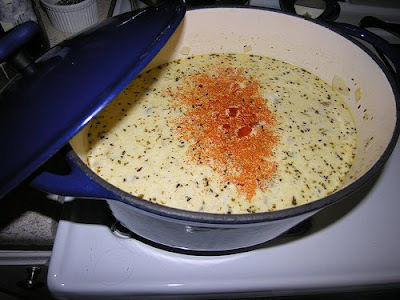 Check out her blog and give this a try in your dutch oven soon! If this doesn't look like a fabulous fall dish, I don't know what does! 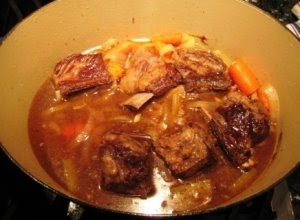 Here, Therese shares with us a recipe for Beer Braised Beef Short Ribs. Inspired by Dave Lieberman, these short ribs take a delicious bath of beer for a couple of hours, resulting in some flavorful eats. Check out Therese's blog for the recipe! 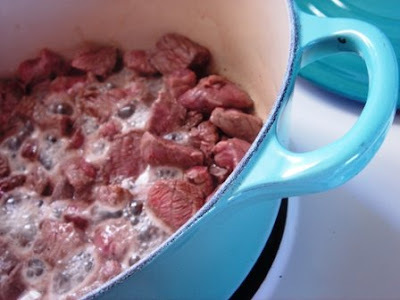 Here's a recipe from Therese that can be made in either a Dutch Oven or baking dish. This dish looks so comforting that you'll definitely want to give this a try during the cooler fall months. To get the recipe, check out Therese's blog! 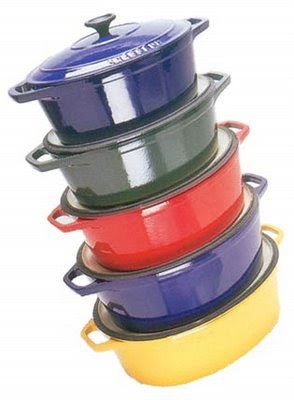 Great Dutch oven recipes! I'm looking forward to cold weather with these recipes.